Beginning with George Washington in 1796, elected officials have a longstanding tradition of warning voters of a partisan apocalypse. In his farewell address Washington said political parties would enable “cunning, ambitious, and unprincipled men” to destroy democracy. We’ve been hearing the warnings for over two centuries – is the partisan apocalypse nigh? 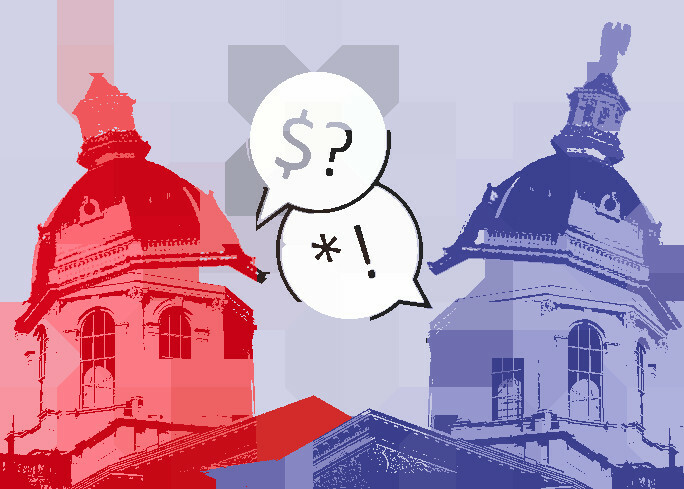 We decided to explore the hard data behind the issue and found that based on at least one measure of partisanship, the New Hampshire House of Representatives is getting more partisan, but the New Hampshire Senate is not. The Senate is also less partisan overall. There are many different ways to measure partisanship and political polarization, but arguably the most well-known is the “party unity” measure from Congressional Quarterly. Party unity is the percentage of votes in each legislative session in which a majority of one party opposed a majority of the other party. This reflects how often legislators drew a sharp line in the sand based on party, with few legislators crossing party lines. In the past twenty years, party unity has fluctuated in the New Hampshire House of Representatives and Senate, with some clear highs and lows. So far in 2019 (through April 4), House party unity is at twenty-year high (88%). Party unity was lowest in 2004 (61%). A linear trendline shows partisanship is increasing in the House over time, although it was on a downward trend from 2014 through 2017. During the same twenty year time period, Senate party unity has stayed roughly level. Party unity was lowest in 2010 (52%) and highest in 2011 (73%). In 2019 Senate party unity is 65% so far. What influences partisanship in NH? There are dozens of factors that likely influence partisanship in the New Hampshire House and Senate. Without controlling for those factors, it’s impossible to reach a firm conclusion as to what is making the New Hampshire House more partisan and keeping the Senate on an even keel. However, it’s easy to speculate. Overall the Senate may be less partisan than the House because it is a smaller body, and each senator represents a large number of citizens spanning a broad political spectrum. In the House, each representative has a small constituency – just over 3,000 – so they don’t have to appeal to as broad a group of voters. It is also possible the House has a higher party unity score because representatives often have less political experience than senators, and certainly fewer staff to help them process bills. This lack of resources may lead them to rely more heavily on party guidance when deciding how to vote. It’s also possible that increased partisanship at the national level might ‘trickle down’ to state legislatures. For example, House and Senate party unity was very high in 2011. This immediately followed the start of the national Tea Party movement, including the election of Bill O’Brien as Speaker of the House. Broader economic trends or a balance of power across different branches of government, which requires compromise in order to get anything done, could also be a factor. Party unity was very low in the House and Senate in 2000. This was a time of economic prosperity, and there was an even balance of political power in New Hampshire government. Democrat Jeanne Shaheen served in the governor’s office, Republicans controlled the House, and the Senate was split down the middle. Despite George Washington’s warnings, partisanship is not necessarily terrible for democracy. Whenever political parties disagree on an issue, it gives voters a clear choice. There is some evidence that a strong partisan divide increases voter turnout – after all, there was record high turnout for the 2018 midterm elections, when partisanship was very high. Also, the increase in partisanship in the New Hampshire House is not inevitable. If voters are suspicious of partisanship, they can elect officials committed to bipartisanship. They can also influence how their legislators vote by attending public hearings, writing letters, calling, and encouraging other voters to do the same. George Washington’s farewell address can give us some more guidance here: “In proportion as the structure of a government gives force to public opinion, it is essential that public opinion should be enlightened.” Citizens Count is committed to making it easier for citizens to enlighten themselves and develop informed opinions about the issues, regardless of where they fall on the political spectrum. We invite you to explore our nonpartisan information on bills, candidates an elected officials at CitizensCount.org. Note: An earlier edition of this article calculated party unity through March 21, 2019. The article was updated April 4, 2019 to include all of the House and Senate roll call votes through Crossover Day.